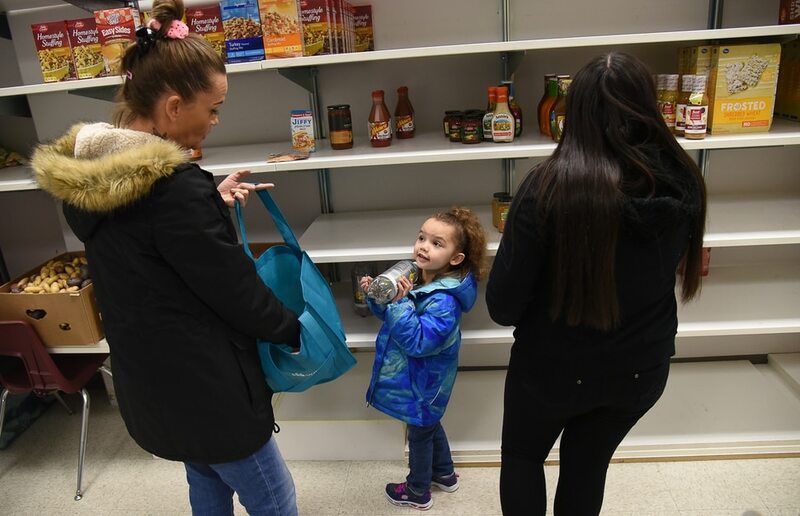 (Francisco Kjolseth | The Salt Lake Tribune) Jodi Burnett, left, picks out food from the pantry with her daughters October, 5, and Isabella Flores, 16, as Salt Lake City's Winter De-Stressor Festival at the Horizonte Instruction and Training Center on Saturday, Dec. 15, 2018, to help families identify and locate services or programs open to youth during between Christmas and New Years. 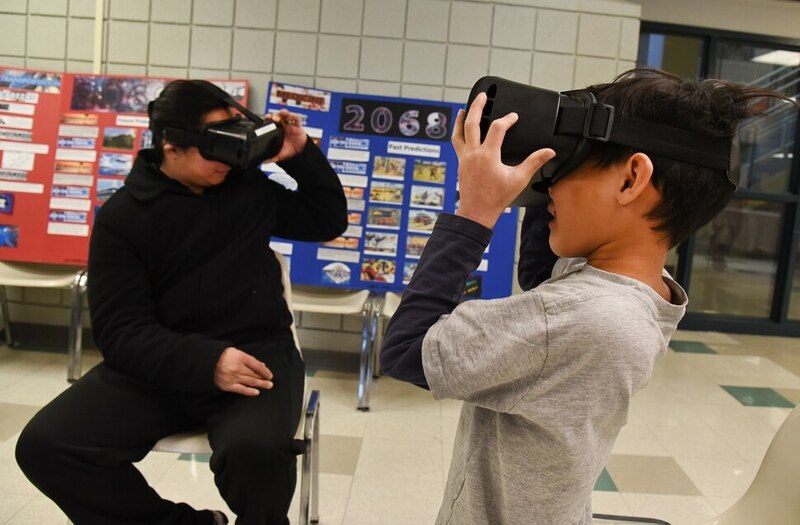 (Francisco Kjolseth | The Salt Lake Tribune) Jonas Orbiso and his son Anthony, 7, immerse themselves in a virtual world as Salt Lake City's Winter De-Stressor Festival at the Horizonte Instruction and Training Center on Saturday, Dec. 15, 2018. The event helped families identify and locate services for youths during between Christmas and New Years. When school is out for winter break, it can have an impact on the state's most vulnerable populations who face food insecurity, access to healthcare services, affordable childcare and safe places for their children. (Francisco Kjolseth | The Salt Lake Tribune) The Utah Food Bank offered free canned foods as part of the Winter De-Stressor Festival, at Horizonte Instruction and Training Center in Salt Lake on Saturday, Dec. 15, 2018. (Francisco Kjolseth | The Salt Lake Tribune) Roselyn Garcia, 2, strikes a pose as Jess Ung with the Division of Youth and Family Services snaps a photo. Families could decorate a frame to hold their print. as part of Salt Lake City's Winter De-Stressor Festival at the Horizonte Instruction and Training Center in Salt Lake on Saturday, Dec. 15, 2018. . (Francisco Kjolseth | The Salt Lake Tribune) Salt Lake City hosts a Winter De-Stressor Festival at the Horizonte Instruction and Training Center in Salt Lake on Saturday, Dec. 15, 2018. The event helped families identify and locate services or programs available for youths between Christmas and New Years. (Francisco Kjolseth | The Salt Lake Tribune) Carol Davis colors with crayons and talks with her son Dante, 11, while attending the Winter De-Stressor Festival at the Horizonte Instruction and Training Center in Salt Lake on Saturday, Dec. 15, 2018. The event helped families identify and locate services or programs for youths between Christmas and New Years. (Francisco Kjolseth | The Salt Lake Tribune) Amihan Orbiso, 5, takes advantage of the kid activities alongside her mother Naro as Salt Lake City's Winter De-Stressor Festival at the Horizonte Instruction and Training Center in Salt Lake on Saturday, Dec. 15, 2018. The event helped families find services or programs for youths between Christmas and New Years. Saving money for Christmas gifts can be stressful for many working parents, but the holiday angst doesn’t end there. What about finding — and funding — a baby sitter for those extended winter breaks when the kids are out of school? “I still have to work,” explained Jacqueline Martinez, a single mother of five children ages 2 to 15. Fortunately, Martinez isn’t afraid to reach out to community groups for help. “I’ve already signed my kids up for day care,” she said Saturday while attending Salt Lake City’s Winter De-Stressor Festival. The event at Salt Lake City’s Horizonte Instruction and Training Center offered families a place to learn about affordable child care options, health and dental services and free family activities available all year long, not just between Christmas and New Year’s Day. 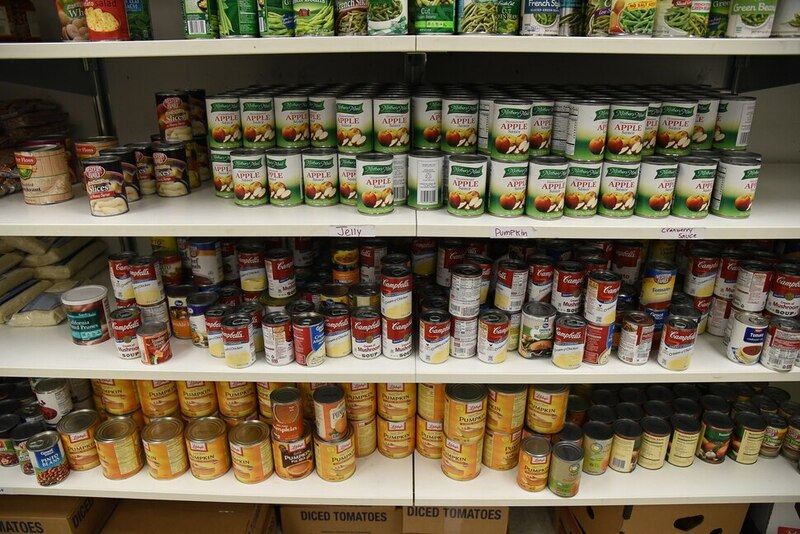 Attendees could get gift cards to grocery stores and fill a bag with soup, macaroni and cheese and other canned food items from the Utah Food Bank. There also were arts and crafts to make and give as gifts; virtual reality experiences; and free health screenings. While the holidays seem stressful for everyone, it’s especially so for vulnerable populations, explained Angela Doan, with the Salt Lake City mayor’s office, which sponsored the event along with the Salt Lake City School District. Doan said the idea for the De-Stressor Festival came about this fall, after the city sponsored a suicide-prevention event. Those who attended talked about when they felt the most troubled and why. “We realized we needed to better support families during this really stressful time,” she said. Luis Andrade and his wife, Katia Garcia, came to the event to get information about the federal Affordable Care Act exchange. Saturday was the last day to enroll for 2019 coverage. While they were there, their 2-year-old daughter, Roselyn, selected a free book from one educational vendor and a new toothbrush from Sacred Circle HealthCare Clinic, which recently added dental services.